Dark Souls already looks pretty nice, so why waste those next-gen resources on graphics when they could be spent improving other things? Modern games aren't quite photorealistic, but they're getting pretty darn close. Close enough that Dark Souls II director Yui Tanimura doesn't feel the need to waste the power of next-gen consoles on minor visual improvements - he'd rather use that computing power on something more practical. Tanimura doesn't actually have any next-gen projects announced, but if he were going to move to the PS4 or Xbox One, he'd love to see what a next-gen physics engine could do. "In terms of graphics, all the consoles have already reached the maximum level," Tanimura says. "From [my] point of view, there's not that [much] difference among the consoles when it comes to graphics." In-game physics, on the other hand, is something that could still be noticeably improved. "In order to implement a physics engine, we'd need more machine power and more CPU power. That can only become possible if we were to create a game for the, for example, PlayStation 4 or Xbox One." 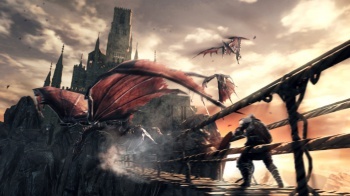 Dark Souls II is currently in development and edging closer to its recently-announced March 11, 2014 release date. From Software is only planning to release the game for PlayStation 3 and Xbox 360, with a PC version coming shortly afterwards. No next-gen versions are confirmed, and while it's still possible, we probably won't see Tanimura's dream of next-gen physics for a while yet.